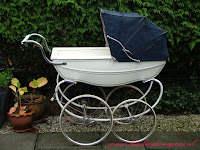 When my children were babies (a long time ago now) a jacket with hood and matching leggings was called a pram set. Hence the name of this design. 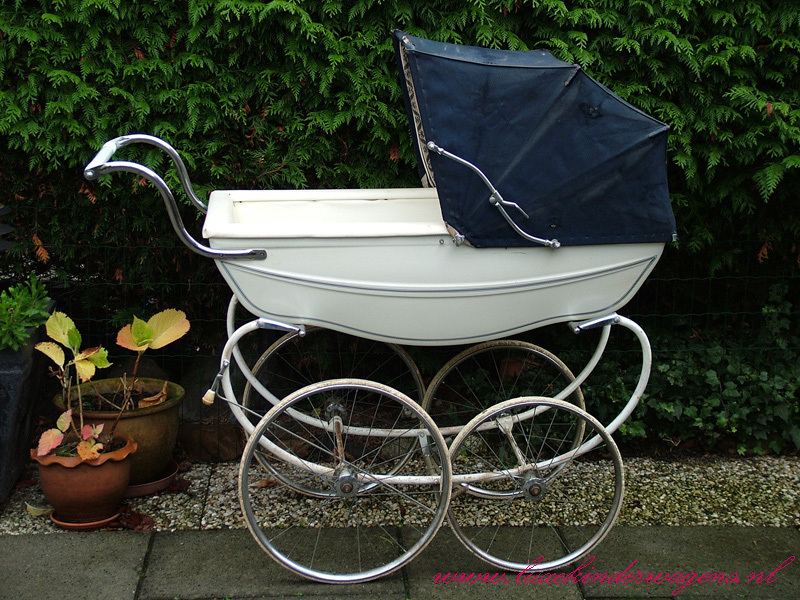 Those were the days when most new mothers had a shiny new pram with matching bag at the front and either a quilted cover or checked Otterburn rug. 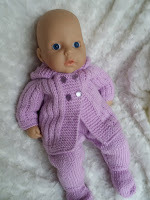 When one of my visitors suggested a jacket and trousers for Annabell to wear in her stroller I came up with this pattern. I tend to be bit old fashioned with my knitting (or as my daughter would say, very old fashioned in everything) and this design is no exception. Its knit in rows to the armholes then in one piece for the shaping, with short seams to sew for the sleeves and sides. The trousers are also knit in rows and seamed along the inner edge. I used King Cole Cherish which is a lovely smooth yarn to work with but any dk would do, just check your tension. A budget yarn would be ideal too as it knits up nice and thick. Continue in stocking stitch inc 1st at each end of next and every following 4th row to 44sts, then every alt row to 50sts. Continue in stocking stitch inc 1 stitch at each end of next and every following 4th row to 44sts, then every alt row to 50sts. 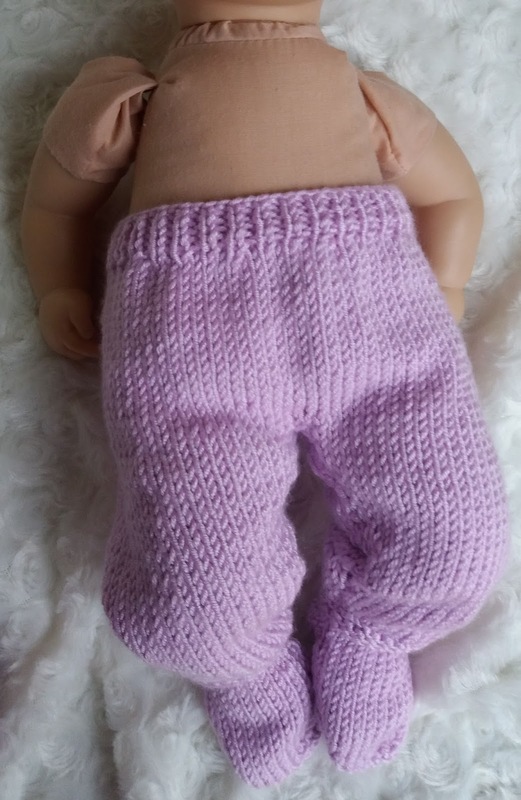 Thank you so much for the beautiful free pattern! I knit the jacket without the hood for my little girl's christmas doll and it came out lovely! Thank you for this lovely pattern. I really enjoyed knitting it. 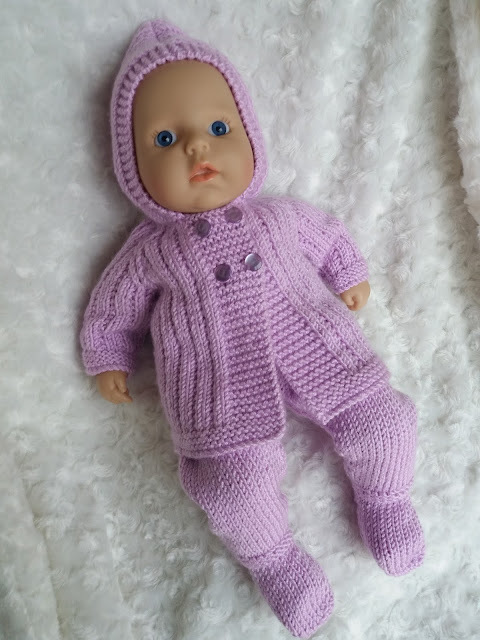 I am on Ravelry but cannot work out how to send you a photo ! Thanks for your comments. On ravelry you would need to set up a project page and link it to the pattern. Its a bit fiddly but quite easy. No worries if you don't, I'm glad you like the pattern.